It hit her hard when she first saw it, the day after, in the newspaper. The man headlong, the towers behind him. The mass of the towers filled the frame of the picture. 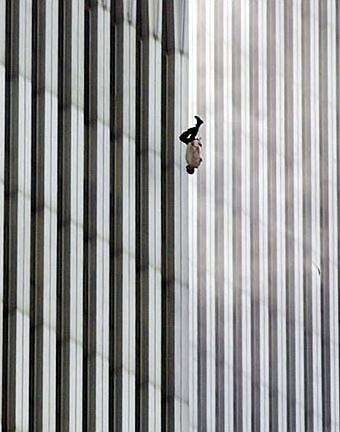 The man falling, the towers continuous, she thought, behind him. The enormous soaring lines, the vertical column stripes. The man with blood on his shirt, she thought, or burn marks, and the effect of the columns behind him, the composition, she thought, darker stripes for the nearer tower, the north, lighter for the other, and the mass, the immensity of it all, and the man set set almost precisely between the rows of darker and lighter stripes. Headlong, free fall, she thought, and this picture burnt a hole in her mind and heart, dear God, he was a falling angel and his beauty was horrific.